Sometimes Dennis & I are asked if we ever get tired of creating our chainsaw-carved dogs. And our answer is always ” no, we enjoy making them.” That doesn’t mean carving is our only artistic activity. Among other things, we enjoy photography, writing, designing & building outlandish (at least in some people’s views, not ours though!) outdoor sculptures, some of which have been showcased in previous blog posts. 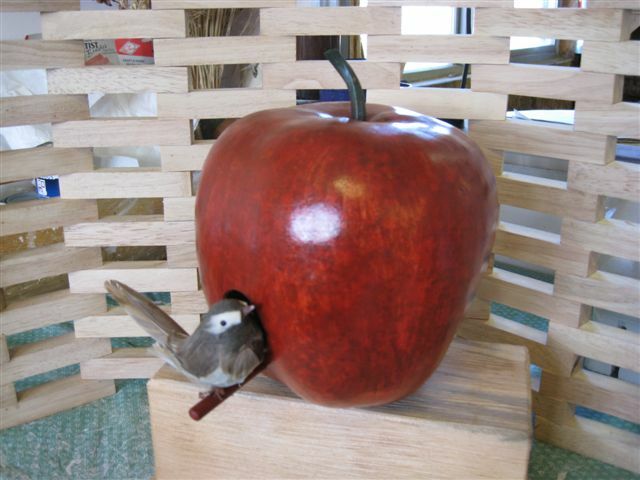 Here’s Apple Gourd Bird House we made a few weeks ago. Until two summers ago we didn’t know there was a gourd variety called Apple Gourd. We purchased one of these striking deep green apple-shaped gourds at a local farmer’s market. After letting the gourd dry and sit neglected for more than a year we cleaned it up, drilled a hole to empty the innards, and painted it apple red. Voila, a pretty decorative birdhouse, complete with green stem and bird on the perch! We’ve found a seed source for the gourds and plan to grow our own apple gourds this summer. Hopefully we’ll have a successful crop for more creative exploration using the dried results. Stay tuned…. Meanwhile, this one gourd birdhouse is available for purchase. $38, includes shipping in continental US. The gourd is about 7 inches in diameter and apx 8 inches high. We will sign it and send with it a few apple gourd seeds for planting. Nice Post! I am looking for Decorative bird houses can you please provide some relevant info regarding it. Great Apple. I am trying to make my own gourd birdhouses to sell on my website at http://www.birdhousespecials.com. Tried my first one last week and used a wood drill bit to drill the hole and split the gourd wide open. At least I have the seeds to plant next year. Looks like I am going to need some practice. If you would like to sell some of your gourd birdhouses on my website drop me an email.